Broccoli belongs to cabbage family. It has large flower heads usually green in color, arranged in a tree like structure branching out from a thick edible stalk. It resembles cauliflower. Broccoli has anti-oxidant, anti-inflammatory and detoxification properties. This is an excellent food because it contains vitamin C, vitamin B complex, vitamin A and vitamin K. It also provides potassium, manganese, phosphorus to the body. This food is very low in saturated fat and cholesterol. Broccoli is low in Sodium and calories. Broccoli is a good food for the weight reduction because it contains vitamins, minerals, proteins and gives few calories to the body. Boiled or steamed or raw forms of broccoli are used for consumption. Some nutrients lost during boiling so steamed or raw forms are good for health. Raw broccoli is used in salads. Broccoli is rich in vitamin C. A single serving provides more than 30 mg of vitamin C and a half cup provides 52 mg of vitamin C. Boiling broccoli reduces the levels of suspected anti-carcinogenic compounds. Steaming, microwaving and stir frying had no significant effect on nutrient loss. Broccoli has good taste and so many nutrients so add broccoli to your diet. 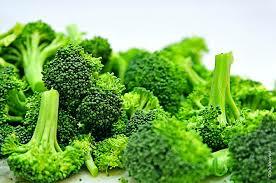 Carotenoids in the broccoli help in the eye health. Broccoli is not a source of vitamin D but it involves in the metabolism of vitamin D. Vitamin K and A are needed to help vitamin D metabolism in the proper balance.